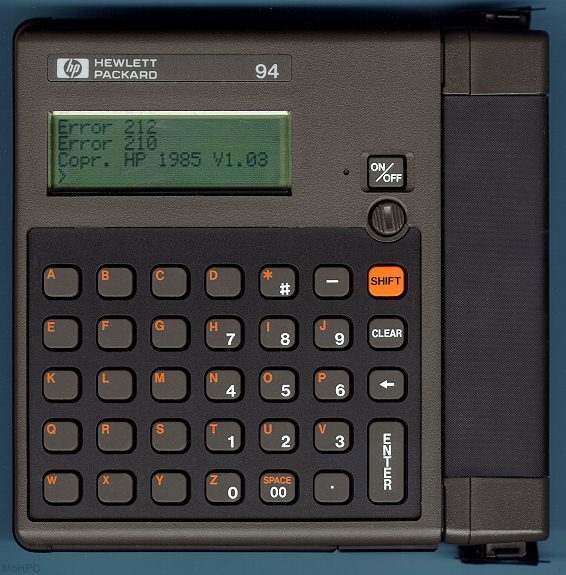 The HP-94 was an industrial hand held computer meant for data logging chores on the factory floor. 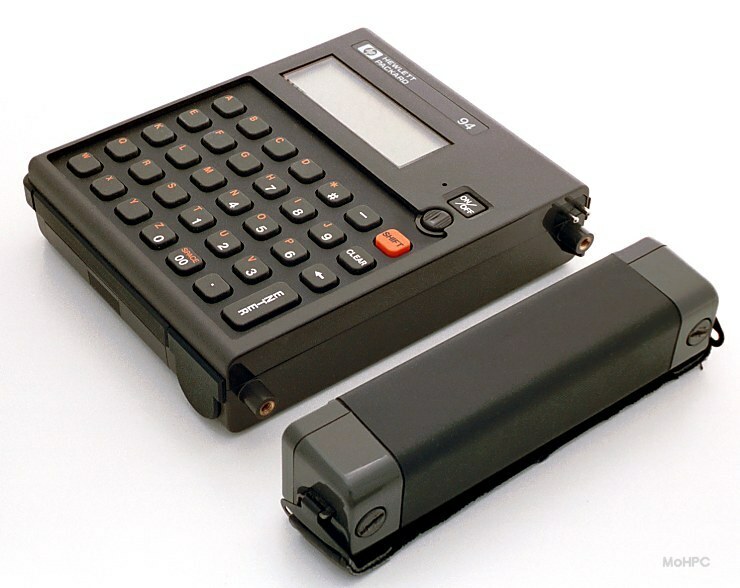 It was packaged in a squarish form factor, with an ABC format keyboard, a 20 character by 4 line backlit LCD display. The battery pack screwed on to the right side and also served as the grip with an elastic band to help avoid dropping the unit. It had a serial port and a port for a bar code wand and an earphone could be connected for environments where the HP-94s loud beep couldn't be heard. The unit also featured a timers, a real-time clock and had a lithium backup-battery. The computer was based on the NEC V20 (8088 compatible) processor but the computer was not PC compatible. Programs were developed on another computer in assembly language or BASIC and then downloaded to the HP-94. Either new BASIC keywords or complete assembly language programs. Files containing BASIC tokens to be interpreted by the built-in interpreter. 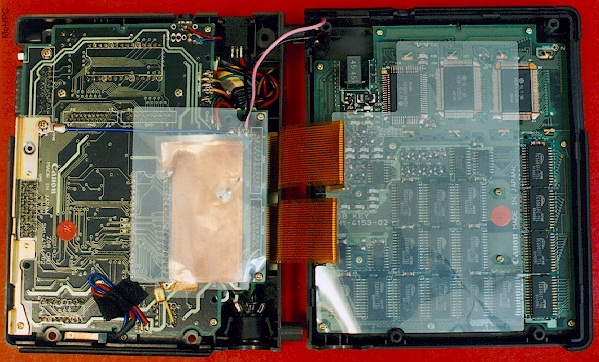 BASIC source code files were converted to tokens before downloading to the HP-94. An assembly language program for controlling IO ports. Similar to a device driver in other operating systems. SY*: (names starting with SY) Assembly language routines. AL>01h End application and enter command mode. BX= Offset of configuration buffer. AL>02h Enable power switch interrupt. Assembly language programs were typically developed with standard Microsoft tools (MASM and LINK). Basic Programs were compiled to tokens which were then interpreted by the built-in interpreter. The 20 character by 4 line line display could be backlit by pressing and holding the shift key until the green backlight activated. This light would remain for several minutes or could be canceled by holding the shift key again. The contrast was controlled by a little knob below the on/off switch. While it was basically a character display, programs could set individual columns of dots within a character and the HP-94 allowed 32 characters in the font to be redefined. These characters were defined in a file that had to be named SYFT. The keyboard was of the rubber membrane style and quite unusual for an HP calculator or computer. (See Manufacturer below.) Oddly, unshifted characters were printed in orange (the color of the Shift key) and shifted characters were printed in white. The Shift key was a toggle, however it was always set back to the default state when Enter was pressed. Because the On/Off switch was under software control, there was a small recessed reset switch to its immediate left. 210 Main memory backup battery low voltage. 211 memory card backup battery low voltage. 212 Main memory directory table inconsistent. 213 memory card directory table inconsistent. 214 Main memory reserved scratch checksum error. 215 Main memory directory table checksum error. 216 Main memory file checksum error. 217 memory card file checksum error. Unusual for HP, the production of the HP-94 was actually done by an outside company. The units were produced in Japan by Canon. An HP-82411A 40K RAM card or an HP-82412A ROM/EPROM card (holding 23-128K) could be plugged into an HP-94D or 93E. 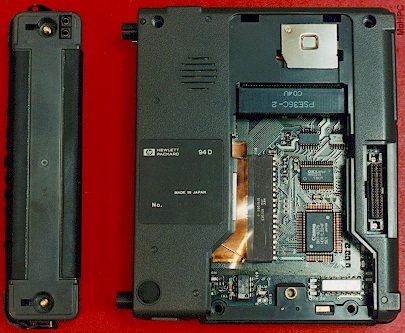 In addition, the HP-94E could be expanded to the equivalent of the HP-94F with the addition of an HP 82410A 128K memory board. The HP-94F could not be expanded.